This resource features the general description of Winterfront City. There are many plot hooks and adventures to be had in this settlement. 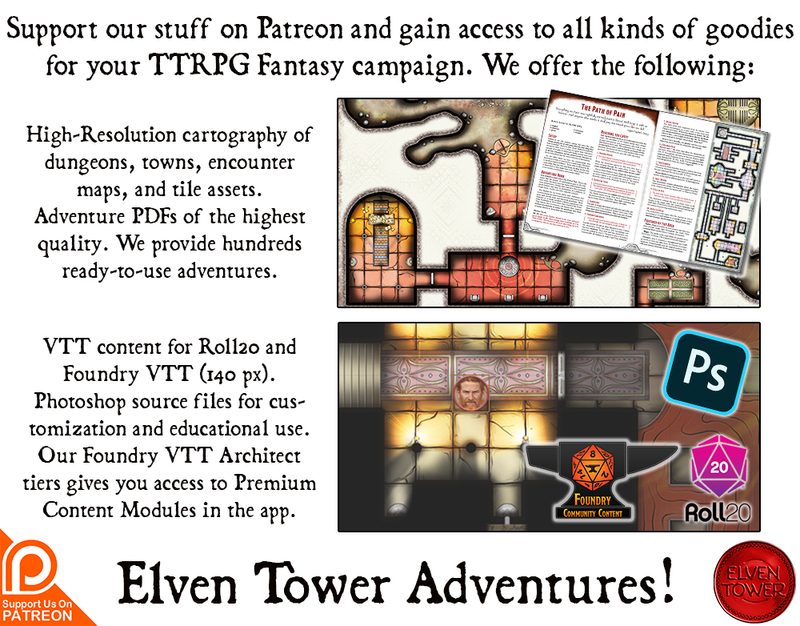 It includes adventure ideas that are appropriate for low to mid-level (Levels 1 to10) adventur­ing parties. Challenge Rating (CR) is calculated using a party of four as the model. They call it the last bastion of humanity. Winterfront is the only remaining walled settlement in the far north. There three cities farther north decades ago but they all fell to the untiring assault of the ice giants. King Jarnoth Snowpick, the current leader of the giants vowed to recover the lands that the All-Father gave them at the beginning of time. No one knows where exactly is the borderline to the extent of land that the giants call theirs, but Winterfront is certainly within as the giants renew their efforts every winter. Despite their strength, Winterfront has prevailed for more than nine years of repeated attacks. And it must do so because the fall of Winterfront would mean the death of thousands of people in the city and even more so in the great plains that lie south of the city. That is the home of countless small settlements which do not have proper walls or people able to defend them from a single giant even. Winterfront has a population of over five thousand inhabitants. Eighty percent of them are human, the rest are a motley crew of many races and ethnicities. Not that ethnicity is an important thing for the city folk in Winterfront, it is not. Winterfront is located in the far north, but it is south enough that snow and ice thaw during the warmer seasons. The weather does not get warm enough for most profitable farming. Life is harsh and cruel in Winterfront and any other village or town nearby. The most important thing people value is hardworking individuals. It is only through work and effort that a community as large as this one may survive in the harsh north. Under such rough circumstances, only the strong may prevail. The lazy, the disabled, the tired, the weak. They do not last long in Winterfront unless someone else is willing to go the extra mile for them. It sounds cruel but it is the way of the world. At least it is in places like this. The outer walls of Winterfront are thirty feet high. They are tall enough to stop most ice giants but there have been a few reports of taller than usual giants which are able to climb over the wall unless impeded. Taller watchtowers fortify the wall every few hundred feet. All of them are fitted with murder holes and trap doors to drop boiling oil on would-be attackers. Each gate is flanked by two watchtowers slightly smaller than the ones on the walls. The gates are fortified with a double drawbridge door and a metal bar portcullis. Over the last nine years, no giant has ever breached the walls or a gate but a few have managed to climb over the wall in the long areas in between watchtowers. There is an inner wall in the middle of the city. The Innu Palace stands in the very center of Winterfront. The Innu Palace is an impregnable fortress which has never fallen to enemy hands. During hard times, women and children of the city are evacuated to the Innu Palace. There is enough space in the castle and dungeons to house most of them. All men from the age of thirteen are not admitted to the palace as they are expected to wield a weapon and defend the city. Despite women’s admittance to the palace, a sizable percentage of them often dismiss the opportunity and go to the front lines to fight. Winterfront women are strong, fierce, and trained to wield spears and swords. A great number of them are also good archers and hunters. Innu Palace is the home of Jarl Hisske, the ruler of Winterfront and all settlements fifty miles from it. The province functions as a feudal state. The Jarl of Winterfront comes from a six hundred years old dynasty. Whoever ruled this land before that is something no one remembers and is not recorded anywhere. It may well be that Jarl Hisske’s ancestors took the land from the giants, but no one can know for sure. The Jarl has chosen the leaders of important families and gave them the title of Earl. These nobles rule the other smaller settlements in the area in the name of the Jarl. They pay tithes and tributes to Winterfront in exchange for protection from the ice giants from the north. The most trusted of them is Earl Gassli. He has come to Winterfront with as many fighting men he can muster every year to defend Winterfront alongside Jarl Hasski. 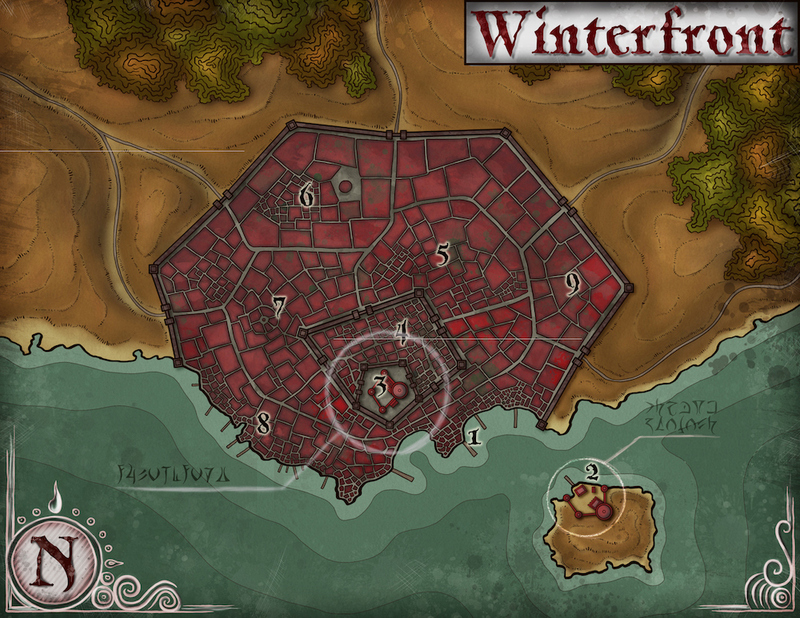 The southernmost part of Winterfront is the port district. It is not protected by a seawall but there is a fortress on an island south of Winterfront, just a few hundred feet from the shore. It is commonly known as the Rocky Fort. Winterfront has a good number of military vessels but most of the fleet are fishing boats and crab boats. The ice giants are known to use ships from time to time but they have not attempted to attack Winterfront from the sea yet. The Jarl knows this is a possibility and tries to be ready every year with sea rangers and able sailors. A small group of elite soldiers and rangers are elected every year to be the Frigid Patrol. These soldiers have a very important task at hand: They must travel north and patrol the harsh region. Their objective is to infiltrate enemy lines and inform the Jarl of the giant’s activities. This is a dangerous mission in which many valiant warriors die every year. During the warmer seasons, they only travel a few days north but they go farther during the winter as it is very important to detect enemy movements in advance. Some patrols include a spellcaster which can inform Winterfront instantly with the use of spells. Otherwise, they use messenger birds to send word south. Currently, the winter is just around the corner and the members of the frigid patrol have sent worrying messages. A patrol sent a report of an ice giant encampment where they have cut down an entire section of a forest to build longships. Three longships were in construction at the moment of the report. The report mentioned that at least five giants would fit inside each longship. Another report from the east talks about a possible alliance between the giants and a faction of goblinoids and orcs. The goblinoids are known to live in the north but they usually do not mess with Waterfrontians. This possible alliance is bad news for all settlements in the area. Jarl Hisske sent letters south to the other great cities of the upcoming threat. His message includes a warning. If Winterfront falls, there is nothing else holding the hordes of giants, goblinoids, and orcs from pillaging their kingdoms in the south. Some letters are also open letters to soldier companies and mercenary houses. Any fighting man willing to travel north and help defend the city during the cold season will be well remunerated. The bounty contract even mentions that heroic deeds during Winterfront’s defense may well earn a nobility title and the right to own land in Winterfront. These are the general features of Winterfront. It is located in the far north and it is the last walled settlement still untaken by ice giants. Terrain. The general area around Winterfront is a barren tundra. It thaws during the warmer seasons and covered in snow during winter and spring. Population. 5000+ inhabitants. 80% human, 5% dwarf, 2% half-orc, 2% halfling, 1% elf, 10% assorted races. Main Exports. Fish, whale oil, hemp, and sea salt.